Milwaukee Thwarted By Robinson and Hughes Duo ~ The Bucky Channel - The World of Sports from Wisconsin's Perspective. Kid Kryponite Lex Luthor'd the Bucks, if that even makes sense. Nate Robinson completely took over in the second half and not only erased the Bucks 9 points halftime lead but carried the Knicks down the stretch. 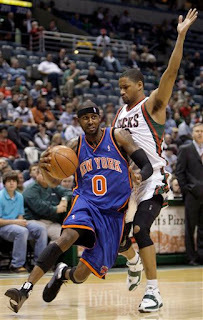 His partner in crime tonight was Larry Hughes who ended up with 39. Nate Robinson scored 32 and had several clutch runners and 3 points plays to hammer home the 120-112 victory for the Knicks. Milwaukee looked so good in the 1st half too. It just wasn't meant to be. Honestly, I don't agree with the whole, its tough to be a team four times. Is it any tougher this time around than the last three, no, but the Knicks brought the scoring in the 2nd half and the Bucks just didn't have an answer. This now brings the Bucks back to a half game out of the 8th seed. Milwaukee's leading scorer was Charlie V with 32 points and 9 rebounds. Ramon Sessions gets the nod as TBC player of the game however with his 22 points, 9 assists and 6 rebounds. Richard Jefferson was 3-16 and ended with 16 points, that a pretty rough shooting night Richie. Charlie Bell added 12 off the bench. Rough game to lose, I cannot describe how my emotions were after the game not mad, disappointed for sure but not completely at a loss for hope.... dejected maybe. Yeah that sounds about right. Back up the truck! Back it up! The Bucks get the Hornets on Friday at 7:30 pm. The game is at home.